We all know that you just can't carry around a machete or sword in most jurisdictions, but that doesn't mean that the skills honed with a long blade can't be useful for the length of knife you're legally permitted to carry. That's where this explosive video production 21st Century Knife Combat, Vol. Two from Paladin Press comes in. World-renowned knife expert Kelly S. Worden cuts through the fantasy inherent in most long blade combat systems, teaching you realistic knife fighting techniques that will work with any length blade. Starting with classical slashing and thrusting lines, Worden continues your education by drawing hard-core applications from the basics that will have your opponent at your mercy in split seconds. From there, he shows never-before-seen tactics from the Filipino flow drill sumbrada, combining them with knife disarms and disabling combative strikes. 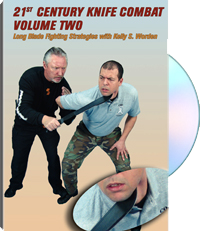 He also teaches how to adapt these real-world knife tactics to the baton, turning what might have been a deadly technique into something less lethal. 21st Century Knife Combat, Vol. Two is the second of a three-part video series on dealing with knife combat in today's violent society. For information purposes only.